A small museum is locked in a battle to keep a medieval jug in the UK. Luton Museum Services has a month to raise £750,000 to match the price offered by New York's Metropolitan Museum of Art for the Wenlok Jug. The jug is inscribed with "My Lord Wenlok", thought to be one of two men connected with the Bedfordshire town. The jug was sold by Sotheby's last year for £568,000 as part of property from Lord Hesketh's Northamptonshire home, where it was found in a cellar. It is thought the jug had not been seen at Lord Hesketh's baronial home of Easton Neston since the 1920s. It is decorated with coats of arms including the Royal arms used between 1340 and 1405. 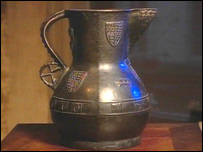 The jug, believed to date from the 14th or 15th Century, was offered to the Met by a London dealer. But last October culture minister David Lammy put a temporary export ban on it, after experts ruled it was of "outstanding significance" for the study of bronze-working in medieval England. The Luton museum, which has £2,500 a year to spend on new exhibits, has already been given £137,500 by the National Art Collections Fund and around £20,000 from friends and local supporters. This week it is likely to hear the outcome of its bid for a grant believed to be around £500,000 from the National Heritage Memorial Fund. One of the most likely candidates for the mysterious Lord Wenlok named on the jug is William Wenlock, who died in 1391 and held the posts of Canon of St Paul's Cathedral, Archdeacon of Rochester and Canon of the King's Chapel, Westminster, in the late 14th Century. Another possibility is his nephew John, first Lord Wenlock, a major figure in political life in the 15th Century who died in 1471 having served every king from Henry V to Edward IV. Both uncle and nephew were closely connected with Luton. Luton Museums Services manager Maggie Appleton said: "Not only is the jug a wonderful object in its own right, it provides a fascinating insight into medieval society in Luton and the surrounding area. "We hope that the acquisition of the Wenlok Jug will also help to resolve the long-standing mystery of who owned the jug."